Key made his foray into historiography after being asked about the Waitangi Tribunal's recent report on Nga Puhi's Treaty claim. The Tribunal has decided that, when they signed on the dotted line in 1840, Nga Puhi chiefs did not believe they were giving away their sovereignty to the British Empire. I appreciate the way you interrupt your analyses of quotidian political life to consider the deep history of our country. In twenty-first century New Zealand, it's rare to find a political commentator with such respect for the past. I have to disagree, though, with your interpretation of the motivations of the Maori signatories of the treaty, which seems to me to owe much less to the scholarship of our historians than it does to the press releases of Muriel Newman, John Ansell, and some of their friends on the far right of the political spectrum. I agree with you that the Musket Wars devastated many iwi and redrew the map of the North Island. But the notion that Maori turned to British power to help them end the Musket Wars ignores the fact that the wars had almost petered out by the 1830s, as iwi achieved military parity, as traditional methods of peacemaking achieved results (consider the peace that Te Wherowhero brokered between the iwi of the upper and middle North Island), and as Maori interpretations of Christian ideology spread. By the end of his life Hongi Hika, the chief had once led raiding parties of thousands across the country, had become a lonely anachronism, whose calls for new campaigns of plunder were scorned by younger Nga Puhi. When, in the middle of the 1830s, two northern Taranaki iwi decided to wage a war of conquest they found so few prospects in our two main islands that they had to sail off to the Chathams. Far from being exhausted by the Musket Wars, northern Maori showed that they were capable of stalemating an imported British army just a few years after 1840. There's also the difficult fact that, in 1840 and for many years afterwards, representatives of the British crown had almost no way of imposing their will on their fellow Pakeha, let alone Maori. When Muriel Newman and her ilk claim that the Crown was able to step into the breach and prevent one iwi attacking another, and thereby prevent the supposedly imminent extinction of much of the Maori people, they are falsely imagining that the Hobson and his comrades possessed the resources of a modern state, like a standing army and a police force. All the British really had in 1840 was a printing press and the seal of their faraway monarch. I think Matthew Wright's book Guns and Utu gives a very credible picture of the balance of political and military forces in New Zealand at the end of the Musket Wars period. Wright ridicules the notion that the British had much agency in New Zealand in the early 1840s, but he also criticises ideas that anything like a unified Maori nation existed back then. Wright warns against a tendency to see the signatories of the Treaty, whether Maori or Pakeha, as far-sighted nation-builders rather than as small-time opportunists fixated on accumulating money and mana. Another of Wright's arguments is relevant to this discussion. He points out that the Treaty of Waitangi cannot in any way be equated with the settling of New Zealand. In 1840 only a tiny number of Pakeha existed, and no Maori could have possibly imagined the tens of thousands who would arrive, courtesy of Wakefield and other impresarios of imperialism, later in the nineteenth century. But it seems to me that, while discussions about the signing of the Treaty are obviously interesting and important, they're not really relevant to John Key's claim that New Zealand was settled peacefully. As the history of imperialism and the histories of the various parts of the Pacific show, there is an enormous difference between symbolic acts like running up a flag and making marks on an official document and the real work of settling new lands. the attempts of Pakeha settlers to acquire, build on and farm land again and again provoked conflict. 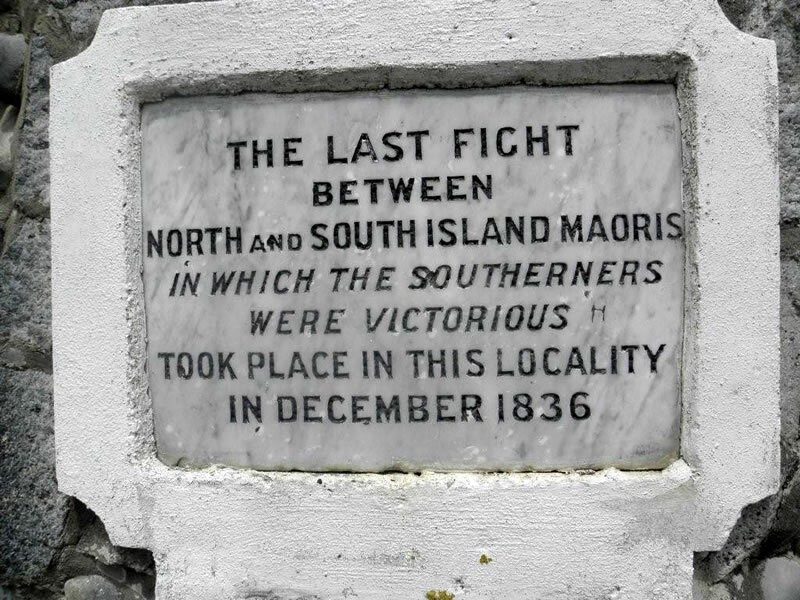 It is battlefields like Rangiriri, Orakau and Te Porere, and not a few marks made on a piece of paper in 1840, that offer a verdict on Key's claim that these islands were settled peacefully. You anticipate some of these criticisms, of course, by acknowledging the conflicts between Maori and the Crown, and by arguing that the death toll they produced was relatively modest. You say that thirty thousand Maori were killed or exiled as a result of the Musket Wars, and contrast that figure with the four thousand Maori and Pakeha who died in battles between Maori and the Crown between 1845 and 1872. I don't think that either of those figures sounds too inaccurate, and I don't doubt that more fighters died during the Musket Wars than in the conflicts between the Crown and iwi that followed the era of Hongi Hika. But it seems odd to me that you include the Maori exiled from their rohe by fighting when you give figures for the victims of the Musket Wars, but that you do not count the refugees from the wars between the Crown and iwi when you give figures for the victims of those wars. After all, the wars in the Taranaki, the Waikato, and on the East Coast produced large numbers of refugees. Most of them were Maori, but more than a few were Pakeha. A very large portion of the people of the Waikato were driven from their homes into the hills and gorges of the central North Island by the invasion of 1863. Many of them died in exile, or only returned after the making of peace two decades later. The Waikato War also emptied a series of fledgling Pakeha villages and towns. Like Waikato civilians, Pakeha who fled the war often lost their possessions. After the town of Raglan was abandoned by settlers afraid of Maori attack, it was 'secured' by a garrison of drunken imperial soldiers who looted and burned its empty homes. The conflict in the Taranaki famously sent hundreds of prisoners south to Lyttleton and Dunedin, and the war on the East Coast saw hundreds of members of iwi like Rongawhakaata and Ngati Porou ending up in places like Te Rohe Potae and the Coromandel. I suspect that, in all, tens of thousands of people were displaced by the series of conflicts between the 1840s and 1870s. You compare the average yearly death toll from the wars 1845 and 1872 with today's road toll, and suggest that these wars were fairly small-scale affairs. But such comparison can easily be misleading, because New Zealand's population is so much greater today than it was in the nineteenth century. When the Waikato War, the largest of the conflicts between Maori and the Crown, was fought in 1863-64, New Zealand's total population was only about 170,000. Pakeha slightly outnumbered Maori. James Belich has pointed out that, in the context of such a small population, the Waikato War was a huge mobilisation of men and resources. On Anzac Day, the appalling cost of World War One to New Zealand is often recalled. We lost sixteen thousand soldiers in pointless battles for the mud of Europe and Turkey, at a time when our total population was little more than a million. But the fact that Maori suffered the same terribly high death rate during the Waikato War is seldom mentioned. Something like twelve hundred of their fighters died during 1863 and '64. When we consider such a loss together with the mass exile of civilians and the confiscation of three million acres by the Crown in 1865 we can begin to appreciate that, for the peoples of the Waikato and their allies, the war against the Pakeha was every bit as traumatic as the earlier clashes with Hongi Hika's musket-armed raiders. *I was honoured to see that several of Key's detractors had linked to old posts on this blog about colonialism and war, like my discussion of Peria, the utopian Maori settlement close to the site of present-day Hobbiton that was destroyed by the Pakeha Orcs who invaded the Waikato. I like to think of this blog as a sort of archive. It's illuminating when you look at demographics, as well: by 1839 the total Pakeha population of Aotearoa was only about 2,000 people (mostly in Northland, and mostly English) whereas estimates of Maori population describe about 100,000 people. But by 1896 there were over 700,000 Pakeha and only around 42,000 Maori. However, even before the Treaty was signed the Maori population is estimated to have fallen by 30% between 1769 and 1840 - and most of these deaths weren't from the Musket Wars but from the introduction, by Pakeha, of various diseases and viruses to which Maori had no immunity - measles, influenza, typhoid, diptheria, whooping cough, tuberculosis, scarlet fever and venereal diseases. So to blame all pre-1840 Maori deaths on the Musket Wars is misleading, and Pakeha disease is I would argue another form of violence. 19th century 'fatal-impact' theorists, such as Isaac Featherstone and Alfred Newman, argued that the Almighty intended Maori to die out and be replaced by a 'superior race'. Their very language is violent, too. John Key used the SIS to nobble the Labour leader just before the 2011 General Election. John Key went on to win the election by 10,000 votes. John Key used the SIS to win the election. I was at Ian Barber's small but exquisitely formed War Memorialisation and the Nation conference in Dunners a couple of weeks ago. In his review of NZ Wars memorials, Nigel Prickett made an interesting observation of the vastly increased numbers of civilian deaths, Maori and European, attested by his readings of headstones and memorials in some Taranaki churchyards. I think he said that the annual death rate for civies something like quadrupled in the first year of conflict versus the preceeding years. Deprivation due to the conflict led to hunger and disease apparently killed far more than those who died directly from the bullet, bayonet and tomahawk. Thanks for that Jono. Nigel Prickett is a god! I love his report on the excavation he did at Queen's Redoubt in Pokeno: it reads like one of Robbe-Grillet's exhaustively strange novels. The debate is rumbling along at Chris' blog. Many Intellectual Property lawyers fail to attract clients because they don't put the effort in to really understand what prospects want, or the information they are looking for. I read you blogpost. Really nice post Thanks for sharing this types post.Keep it up.